Baby Critter Blanket The idea for these little critter blankets came during a shopping trip to Cabela's with my husband. They had a large bear rug made like this. I decided it would be a fun idea for the Grandkids. They were a hit. Try them with any size critter. Just adjust the size of the blanket. This larger one is 30"x 30" and the smaller one is 19"x 19". These little Critter blankets are the best snugglers ever. 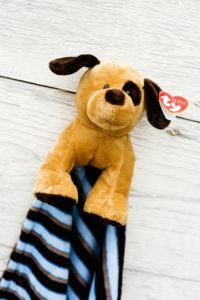 Made from the Ty Pluffies and Minkee Cuddle they can't get much softer than this. 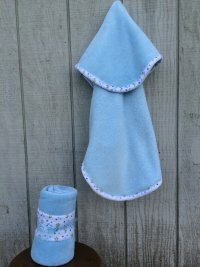 These little soft and cuddly blankets soon become babies first love. 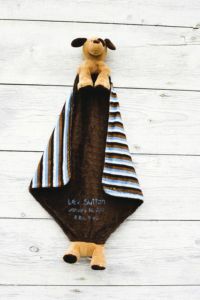 By following my simple step by step instruction I am sure you will find the Critter Blanket is a quick, easy original gift to give. 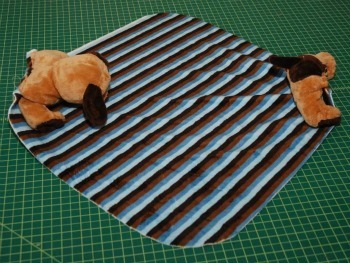 The hardest part of making the Critter blanket is cutting the little pet in half. Don't let the kids watch you, they will try to talk you out of cutting it. First, find the center point between the two legs. Cut it right in the center. You need to be sure you have plenty for your seam allowance. 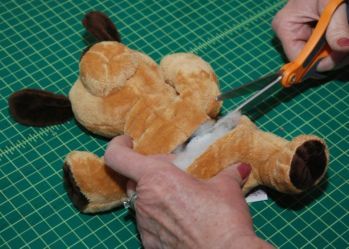 Cut carefully just through the fabric, don't try to cut through the whole critter. As you cut carefully separate the top from the bottom. As you separate the top and bottom pieces you will find a little bag of beads. Take that out. As you cut, be careful not to cut that open. Save that for another project, we won't use it as it is to heavy. Re-distribute the rest of the stuffing so the top and bottom have equal amounts. 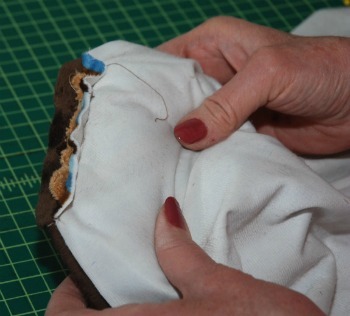 Using a strong thread and a running stitch, hand baste the top and bottom pieces closed. Be sure to use about a 3//8" seam allowance. That will make it easier to work with on the sewing machine. Adjust the width so it is about 2 1/2". Set the little critter parts aside and prepare your blanket. Lay two pieces right sides together. Be sure that you have the stretch sides together and the selvages sides together. 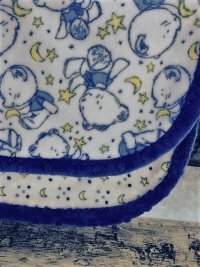 Because this fabric is a little stretchy it is really hard to sew them when they are opposite. You also want to be sure you have the "nap" going the same direction on both pieces. It all works better if everything is going the same direction. 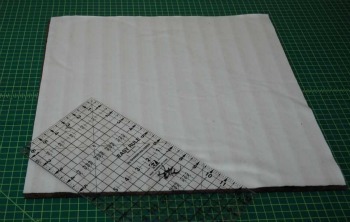 Using your cutter and ruler, square the pieces so they are the same size. After you have squared up the blanket, cut a 3" triangle off of two opposite corners. This is where you will place the critters head and bottom. 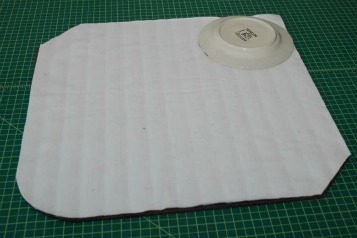 Using saucer for your template round the other two corners. 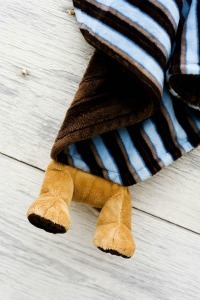 Place your head and tail parts on the opposite ends of your blanket. I like to place the head so that the nap is going down from the head. 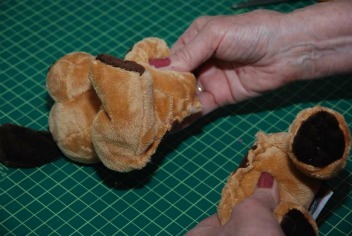 Always place both critters so that the tummy is down and the feet are going out. If you don't, you get the head and feet going opposite directions. 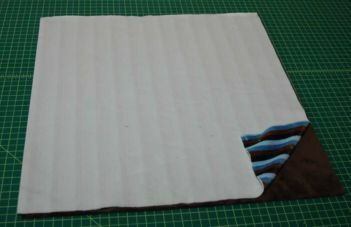 Place the backing fabric right sides together with the top, matching your corner. Turn the blanket over so you can see your stitching line. 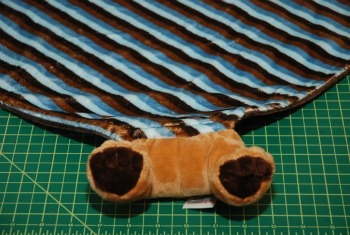 Use the stitches for a guide as you sew the critter corners. This is a good time to look to make sure you have all of the gathers inside of the seam. 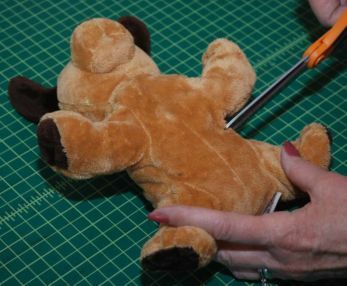 A zipper foot or moving the needle position so you can sew close to the critter may help. Continue to sew around the blanket. Pin the rounded corners as to keep them straight and even. Leave a 4" opening on the straight grain side. This makes it easier when hand sewing the opening closes as it doesn't stretch. Reach into the opening and pull out the little head. You're almost finished. 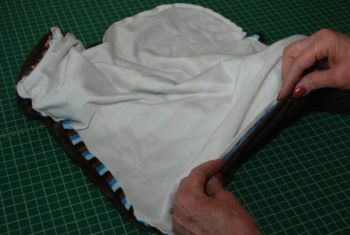 Flatten out your edges and hand sew the opening closed. Top stitch around all of the edges. 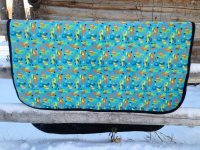 This will keep your little blanket edges flat. Your blanket is finished. Congratulations. You are going to make a baby really happy.